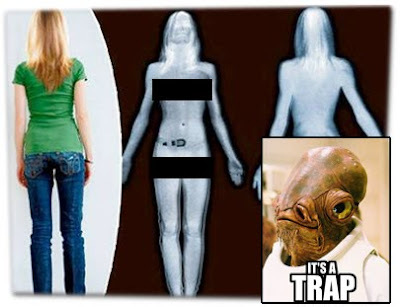 Debunking the Debunkers: IT'S A TRAP!!! God dammit! I hate being duped by disinformation. Ok so there's this image making its rounds around the internets that has been presented as an actual scan from one of the airport body scanners now cropping up all over the globe in light of the recent staged terrorist incident. People in the truth and patriot communities have been using it as evidence that the scanners are more revealing than the mainstream media is telling us. While I have no doubt that the scanners are indeed more revealing than what the media is telling us, I've just learned this image is disinformation. It would appear as though someone has just taken those two photos, photoshopped them to invert the colours and add weapons and claimed them to be body scanner images. I kind of wish I hadn't shown it to all my friends and said "See, the media is lying to you!" now. Grrr. Was sieht man wirklich im Nackt-Scanner?